Murphy & Dittenhafer Architects’ expertise in transforming community colleges is helping make those institutions more attractive to potential students..
With the cost of higher education straining the finances of many high school graduates, community colleges can provide an affordable option while offering modern facilities and cutting-edge technology that help them compete with four-year schools. But upgrading buildings and creating functional, aesthetically pleasing spaces must be done cost-efficiently at the two-year campuses. That’s where Murphy & Dittenhafer Architects comes in. 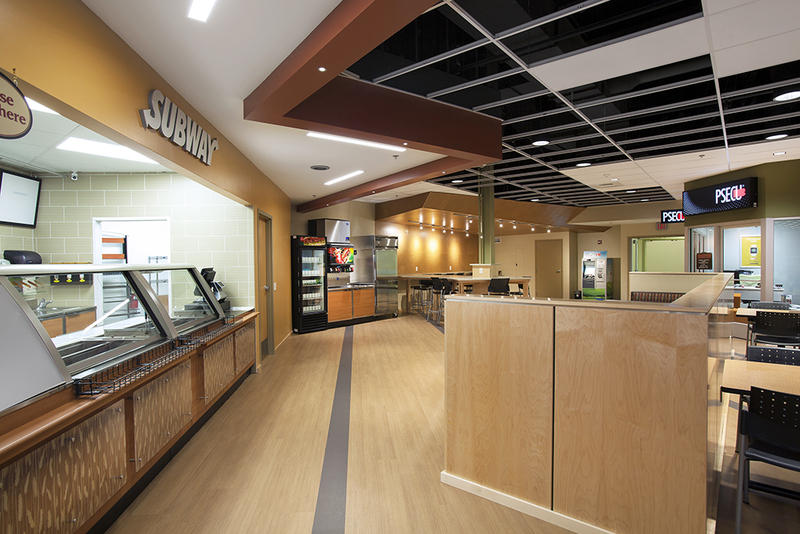 The firm, located in Baltimore and York, Pennsylvania, has designed projects large and small at community colleges in Maryland and Central Pennsylvania for more than 20 years. “We have a very strong interest in community colleges,” says Frank E. Dittenhafer II, FAIA, LEED AP of the firm, noting that the schools help students who might work full or part time - advance their education and increase their skill sets before moving on to a four-year campus – or their next employment situation. The bottom line and energy efficiency are important. Beyond design, architect Peter Schwab says the firm thinks in terms of progressive educational concepts, such as distance learning, where students in another country can interact with a local class, and hybrid learning, where students might be on campus three days a week and study at home two days. That allows the school to bring more students onto campus. In one of the firm’s larger projects, at Prince George's Community College in Maryland, the architects were charged with improving sight, sound and function. Schwab was the project manager and Grove was lead architect in the transformation of Lanham Hall – a nearly windowless 1970s student services building – into an attractive structure hailed for its sustainable features. The project opened up exterior walls and added glass, turned pathways between sections of the building into lounges and a gallery, and created a new acoustically advanced elliptical lecture hall in which the instructor can be heard without a microphone. The renovated building is a showpiece that can be seen from a nearby highway, which Schwab says heightens the school’s public profile. “We are really proud and excited about it because it was an extreme transformation,” Dittenhafer points out. 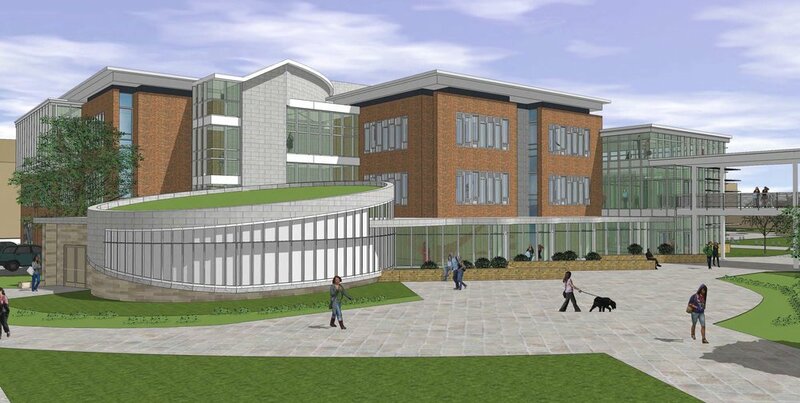 The firm also has a long-standing relationship with Howard Community College in Columbia, Maryland, involving the design of both major and minor renovations to campus buildings. 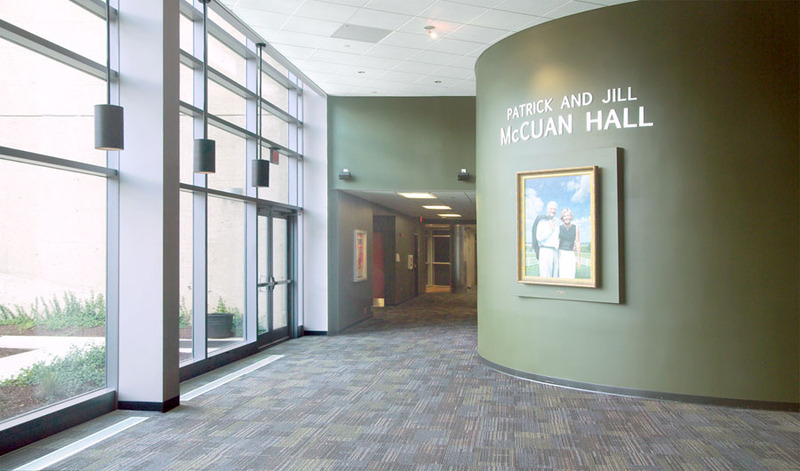 The McCuan Hall transformation provided new facilities for the College Administration and President’s Office, Campus Development, General Purpose Classrooms, HCC TV and an Art Exhibition Space for changing exhibits. M&D also designed a comprehensive “makeover” for the 420-seat Smith Theater – a heavily use facility by both the College and surrounding community. For the $16 million Clark Hall renovation, Murphy & Dittenhafer designed a four-phased renovation covering all areas of the 77,000-square-foot, two-story building – the first building constructed for Howard Community College at the Columbia campus in the early 1970’s. As part of the project, the main campus library was completely transformed via new small study rooms, additional open plan areas with a soft seating area, group multi-media viewing areas, new circulation desk/counter and library staff offices, more intimate classrooms and wi-fi access provide throughout. The African American Cultural Center was expanded, and usability significantly improved. The M&D team is currently assisting Howard Community College with revamping its Photographic Arts suite to convert color film lab areas into state of the art digital photo lab areas and related instructional/classroom space. A project at the Essex campus of the Community College of Baltimore County is rescuing an important academic program. 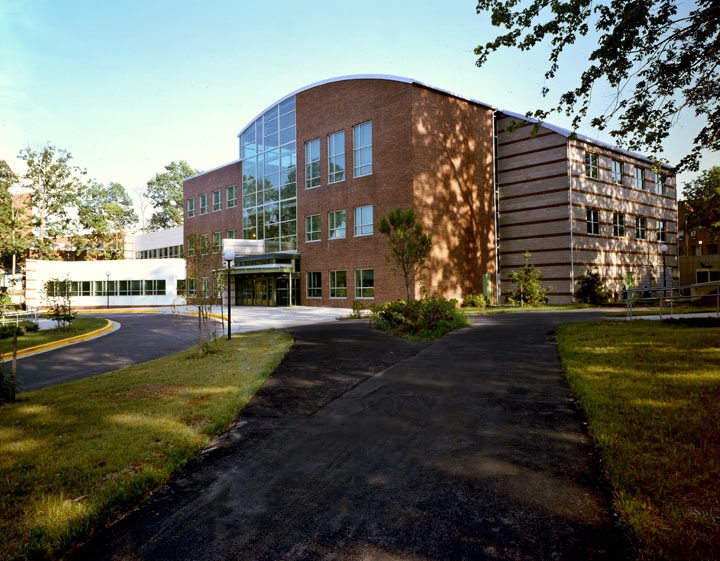 The school’s Veterinary Technology Center was threatened with losing its accreditation because of the poor, older space it inhabited. Murphy & Dittenhafer Architects is turning that location into a state of the art veterinary hospital with areas for surgery, exams, and instruction. It will reopen in the fall. Sometimes, commuter students just need a place where they can relax between classes – and remain on campus. Harrisburg Area Community College’s York campus lacked a student commons, offering only a long hallway with long line of mismatched chairs. 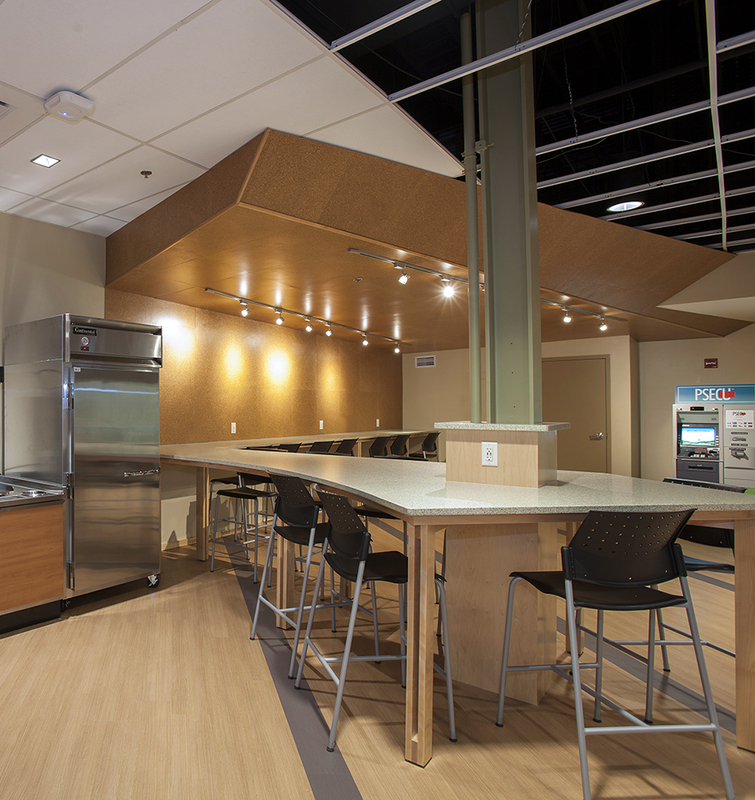 M&D took an adjacent vacant room, put in booths and a banquette, a high counter with stools and lots of cool loose seating - and created “a very interesting place for students to gather and sit,” Dittenhafer says. That’s an important aspect of the firm’s work at two-year schools. The firm’s successful designs generate repeat projects at schools. At Allegany College of Maryland in Cumberland, the architects have remade a 1970s tech building, with five levels erected on a slope, into a campus icon. The building includes a unique elevator with doors that open on the front and side to access lounge areas on multiple levels of the new central lobby. The firm has redesigned a major courtyard at the school and fashioned a new NCAA women’s softball field that had to satisfy floodplain requirements. It also is at work on a Welcome Center as an addition to the library building.